For most of the anime film franchise’s twenty year history, the silver screen adventures of Ash and his revolving door of friends have centred on a particular flavour of the month: a legendary or mythical Pokémon that must be protected from some dubious or misguided scheme, culminating in a battle between these magical creatures. However, the Pokémon world is vast with many untapped possibilities, so I’ve always wondered what would happen if we had a story about people that just happened to be set in the Pokémon world. Pokémon the Movie: The Power of Us finally gave me my answer – the best film in the series’ twenty year history. With last year’s smash-hit Pokémon the Movie: I Choose You being a more literal interpretation of Ash’s iconic starting days, its follow-up is a more symbolic re-imagining of the relationship between people and Pokémon. This is shown more overtly with “The Curse of Zeraora”, a legend promising misfortune on anyone who enters the site of a historic forest fire, and more subtly by the selection of The Power of Us’ large cast, where Ash is the only Pokémon Trainer in the film! This disconnect from what we assume a typical Pokémon movie’s cast to be is established right from the opening scene, when we meet Risa. A trendy high-school student and former athlete who knows nothing about Pokémon, while visiting her younger brother in hospital, Risa is talked into visiting Fula City in his stead to catch him a Pokémon he desires – despite her protests. A seaside city powered by a series of majestic turbines, Fula City is in the midst of celebrating its annual Wind Festival, a celebration of the legendary Lugia. The festivities have drawn in large crowds from all walks of life, like the middle-aged Callahan who tells tall tales to impress his niece, the timid researcher Toren who must overcome his nerves before a big presentation, and the elderly Harriet who despises Pokémon. Ash Ketchum is naturally drawn to Fula City as well, and joins the festivities after saving the mayor’s daughter Margo from a kid’s Phanpy. When a disaster threatens Fula City however, these people, who couldn’t be more different, will have to come together to save people and Pokémon alike. Despite their large number, the cast of The Power of Us cross paths and ultimately come together seamlessly, with plot-threads so expertly woven through earlier actions and connections, that even characters who couldn’t be more different feel natural standing side-by-side by the end. The film’s running time is also near-evenly split between the cast, with them all feeling like protagonists of their own stories. I would have liked to see a bit more time spent with Toren however, to provide more depth to his anxiety and ambitions. Although Harriet’s storyline made for great comic relief, with the sudden appearance of Pokémon like Machamp proving a great use of visual humour, I also think we could have been more carefully eased into her dramatic revelations towards the end of the film, which almost felt like they came out of nowhere. It’s weird to think that the part of a Pokémon movie I enjoyed most was a middle-aged man, but Callahan had the most defined character arc and ultimately, is more integral to the film than even Ash. Callahan isn’t a bad person; he just wants to impress his niece and make her happy. Lies always come back to bite however, and the realisation of what they’ve cost him culminates in the film’s most emotional moment, where a Sudowoodo, of all things, made me cry! Having irritated Callahan by following him ever since he saved it from an angry Golduck, Sudowoodo’s presence was mostly played for comic relief, until the faux tree shows us that a Pokémon can also be that good friend who can help put us back in line when we lose our way. You may notice that I’ve seldom mentioned The Power of Us’ poster Pokémon, the mythical Zeraora, who has headlined a new Trading Card Game set and video game promotion surrounding the film’s release. That’s because, with so much time spent establishing the human characters, Zeraora doesn’t make its entrance until the film’s second half, where the story really kicks into gear. Unlike Marshadow in last year’s Pokémon the Movie: I Choose You, the beastly Zeraora never feels tacked on for multimedia merchandising and instead, plays an integral role in the latter half, as the culmination of The Power of Us’ overarching theme of people’s relationship with Pokémon. It’s likely no mistake that Zeraora’s role feels much like that of the humans; a resident of Fula City whose own story intertwines with others, as they come together to protect what’s precious to them. However, while the film was initially teased with a song from the Japanese version of Pokémon the Movie 2000 and its alternate title The Power of One is referenced by this film’s title (The Power of Us), those expecting to see Lugia in action will be disappointed. The iconic legendary Pokémon only makes a very fleeting appearance, with the majority of its involvement being behind the scenes. 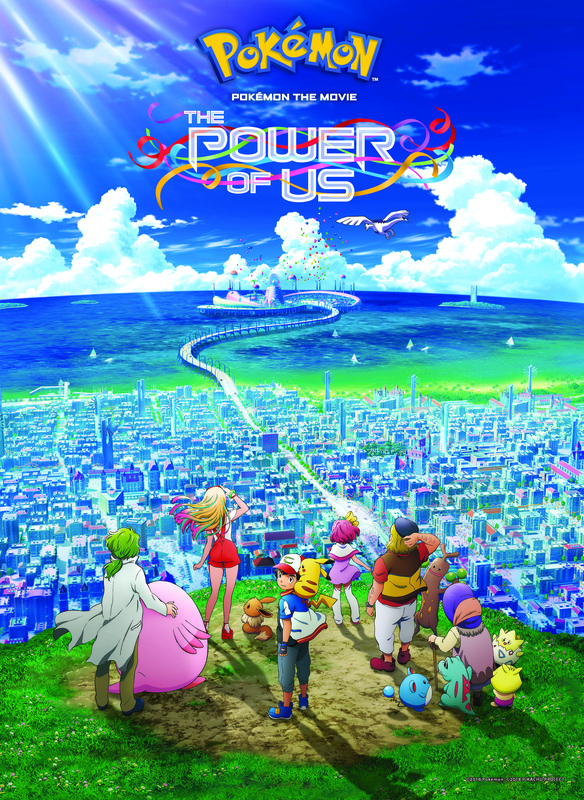 Pokémon the Movie: The Power of Us is notable in being the first of the series’ twenty-one films not directed by Kunihiko Yuyama, who instead serves as animation supervisor. With all due respect to Yuyama, Pokémon the Series: XY director Tetsuo Yajima brings a much-needed breath of fresh air at the helm. For example, many of the template elements I complained about in my recent XY Movie Collection review are noticeably absent (yes – there’s no telepathy!). This isn’t the only major change to a Pokémon movie’s production however, with franchise regulars OLM, Inc. being assisted here by Wit Studio, of Attack on Titan and The Ancient Magus’ Bride fame. It’s difficult to pinpoint what impact Wit Studio has had on the animation quality, although the dynamic camera in a sequence where Ash chases a rampaging Tyranitar does evoke memories of the slick movements seen in Attack on Titan. However, there are instances of clumsy CG people in crowd scenes that aren’t typically a calling card of OLM, Inc., whose use of 3D imagery in Pokémon has been most noticeably tied to mechanical structures. While the CG crowds weren’t as bad, they did remind me of the cycling scenes in last year’s Fireworks, which I’d rather not remember. Wonky CG aside, The Power of Us looks great. Concerns were raised about Ash’s new look shortly after the film’s reveal, but the character designs by Shizue Kaneko (How NOT to Summon a Demon Lord) are distinct and allow the characters to be more expressive than ever before. One of my favourite visual moments, is when after an especially long hike, the usually well-styled Risa emerges from an elevator an unkempt mess, her make-up running down her face and her clothes dishevelled. While a brief visual gag, it both reveals the complexity of Risa’s design, and reveals more about her personality. This film’s more diverse spread of brighter colours may leave viewers finding the visuals less impactful than I Choose You, which used the striking image of a warm sunrise in its key art, yet The Power of Us is one of the better looking Pokémon movies of recent years. I know it’s an awful cliché to say that a film made me both laugh and cry, but Pokémon the Movie: The Power of Us really did! The humour is perfectly timed, and when the film wants to strike an emotional chord, it knows how to. The new characters are also utterly charming, and I would definitely like to see more of Risa in particular. The greatest tug on my heart-strings though, came from the film prompting me to reflect on my own personal relationship with Pokémon, which is 19 years’ old and counting! In that time, I’ve met many fans who will freely admit that the majority of the series’ films aren’t really that good, but The Pokémon Company have been on a roll these past couple of years. Pokémon the Movie: The Power of Us is a much-needed change of pace, creating a charming film that’s less about flashy monster battles and more on the people who just happen to live in a Pokémon world. No prior knowledge is required to enjoy this film, so I wholeheartedly recommend it to any Pokémon fan – just remember to stay behind after the credits! Screenings of Pokémon the Movie: The Power of Us are preceded by two episodes of the Pokémon Generations web series (“The Lake of Rage” and “The Reawakening”), as well as a brief recorded interview with Kunihiko Yuyama, which also features Pokémon Detective Pikachu director Rob Letterman. A brand new trailer for Pokémon The Movie: Everyone’s Story has unveiled a brand new species – the Mythical Pokémon Zeraora, the last of the franchise’s seventh generation! This weekend is your last chance to see Pokémon the Movie: The Power of Us in cinemas – and two of our lucky readers can win a pair of tickets! Read more to find out how. Lugia returns in the brand new Pokémon anime feature film, which has a brand new trailer and official trailer!